i. We prefer (lose/loose) clothes in summer season. ii. When does the new law come into (effect/affect). iii. Human beings should be guided by their moral (principal/principle). iv. It is good to keep record in (diary/dairy) for our future remembrance. v. What did the doctor (advise/advice) you when you visited him last time? vi. Let's all live in (peace/piece) and harmony. i. We prefer loose clothes in summer season. ii. When does the new law come into effect. iii. Human beings should be guided by their moral principle. iv. It is good to keep record in diary for our future remembrance. v. What did the doctor advise you when you visited him last time? vi. Let's all live in peace and harmony. i. Birds of same feathers flock together. ii. The lunch was ready by half past nine. i. We (get) up at 5:30 this morning. ii. Time and tide (wait) for none. iii. When does the new law (come) into effect. iv. We (have) our meal at college together when we were at hostel. v. Slow and steady (win) the race. vi. Look! the children (run) on the oval ground. i. We got up at 5:30 this morning. ii. Time and tide waits for none. iii. When does the new law come into effect. iv. We had our meal at college together when we were at hostel. v. Slow and steady wins the race. vi. Look! the children are running on the oval ground. a. Assuming yourself as Armando Gonzalez, retell the story "Fear" in about 200 words. d. Interpret the poem "Keeping Things Whole" in a paragraph. Research shows that the children who have a parent who smokes are more likely to smoke and to be heavier smokes at young ages. When parents quit smoking, their children become less likely to start smoking and more likely to quit if they have already started smoking. If you smoke, share your struggles to quit with your children. 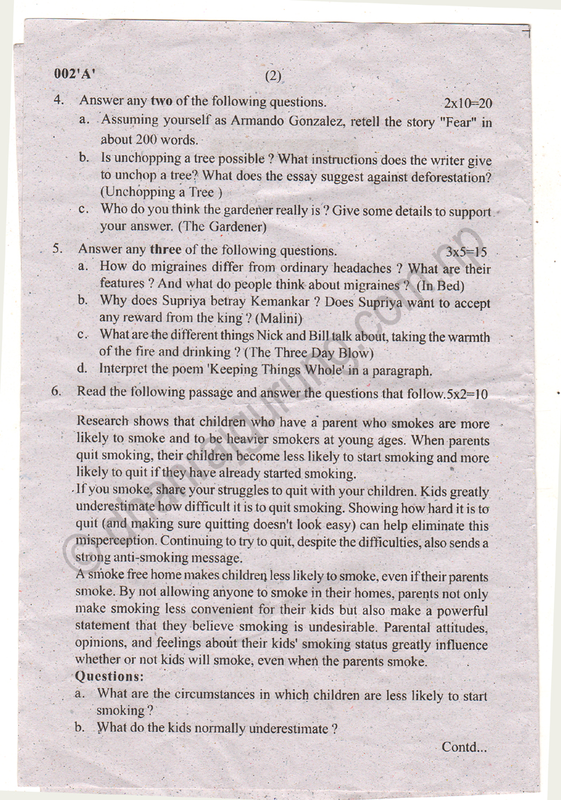 Kids greatly underestimate how difficult it is to quit smoking. Showing how hard it is to quit (and making sure quitting doesn't look easy) can help eliminate this misperception. Continuing to try to quit, despite the difficulties, also sends a strong anti-smoking message. A smoke free home makes children less likely to smoke, even if their parents smoke. By not allowing anyone to smoke in their homes, parents not only make smoking less convenient for their kids but also make a powerful statement that they believe smoking is undesirable. Parental attitudes, opinions, and feelings about their kids' smoking status greatly influence whether or not kids will smoke, even when the parents smoke. a. What are the circumstances in which children are less likely to start smoking? b. What do the kids normally underestimate? c. What does a smoke-free home help children? d. What message does a smoke free home give the kids? e. Summarise the passage in a sentence or two. - sending a strong anti-smoking message. b. The kids normally underestimate to quit smoking. c. A smoke free home helps children less likely to smoke by not allowing anyone to smoke in their home even their parents smoke. d. Parents from smoke free home make smoking less convenient for their kids and make them believe smoking is undesirable. a. Describe a big public event that you attended as an important person. Explain what it was like and what made the event memorable. b. Write an article on "good and bad effect of watching TV frequently, especially for the children and college goers". He was driving so fast-he skidded. If he had been driving slowly, he would not have skidded. a. She didn't hear the knock on the door - she was listening to the radio. b. They were not in the mosque-they weren't killed in the explosion. c. He was walking on the seashore when he found a gold ring. d. She couldn't go on holiday - she had examination of her third term. e. He wasn't talking very loudly - I couldn't understand him. a. If she hadn't been listening to the radio, she would have heard the knock on the door. Or - If she had heard the knock on the door, she wouldn't have been listening to the radio. b. If they had been on the mosque, they would have been killed in the explosion. c. If he hadn't been walking on the seashore, he wouldn't have found a gold ring. d. If she hadn't have examination of her third term, she could have gone on holiday. e. If he had been talking loudly, I could have understood him. a. I like my boss sending me to different parts of the country. b. I love people serving me tasty food. c. I adore people encouraging me all the time. d. I admire people helping me with my study. e. I appreciate people serving me tea on bed. a. I like being sent to different part of the country. b. I love being served with tasty food. c. I adore being encouraged all the time. d. I admire being helped with the study. e. I appreciate being served with tea on bed. The road is narrow. You can't drive along it. i) The road is too narrow to drive along. 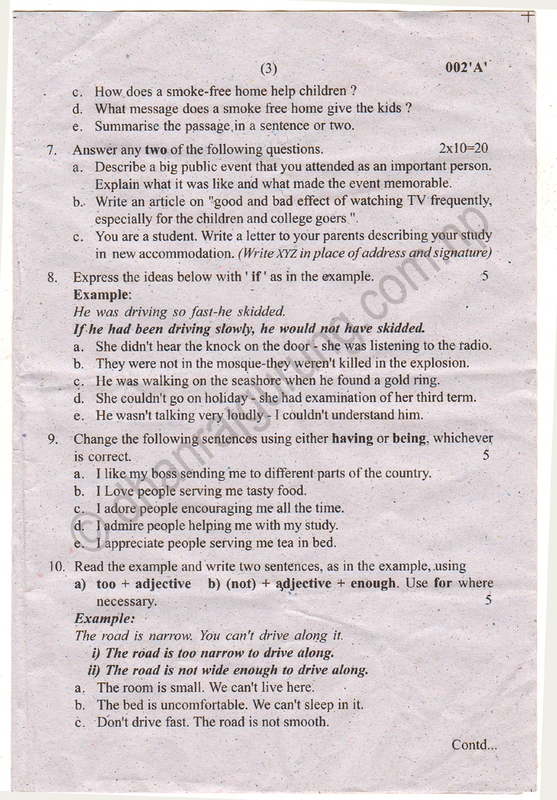 ii) The road is not wide enough to drive along. a. The room is small. We can't live here. b. The bed is uncomfortable. We can't sleep in it. c. Don't drive fast. The road is not smooth. d. Don't eat that bread. It is stale. e. Your sweater is thin. You can't wear it in winter. - The room is too small to live. - The room is not big enough to live. - The bed is too uncomfortable to sleep in. - The bed is not comfortable enough to sleep in. - The road is too harsh to drive fast. - The road is not smooth enough to drive fast. - That bread is too stale to eat. - That bread is not fresh enough to eat. - Your sweater is too thin to wear in winter. - Your sweater isn't thick enough to wear in winter. a. Someone is following us. b. The bike is overtaking us. c. A man is feeding the tiger. d. Nobody is using the bike today. e. Some children are pulling the rope. a. We are being followed. b. We are being overtaken. c. The tiger is being fed. d. The bike is not being used today. e. The rope is being pulled. 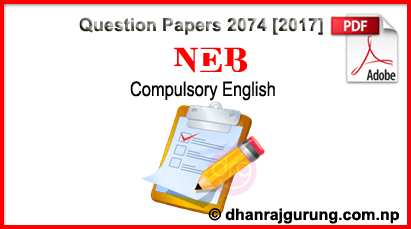 6 Responses to "Compulsory English | Grade XI | Examination Paper 2074  | NEB | With SOLUTION"
will you send me answer of all this question?? Done Niharika! You can help by liking or sharing this post with your friends and beloved ones! Really helpful. A very big thanks to you for great effort and helping us. Keep it up Sir.